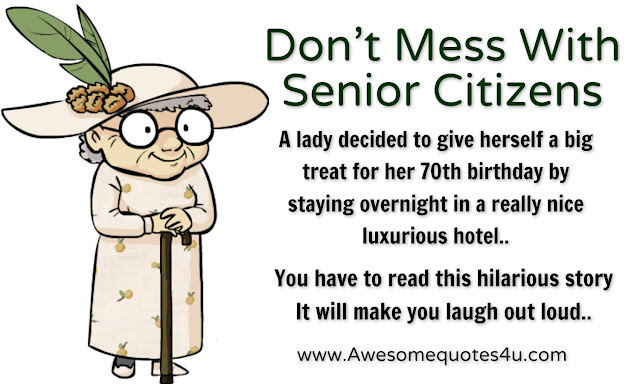 A lady decided to give herself a big treat for her 70th birthday by staying overnight in a really nice luxurious hotel.. When she checked out the next morning, the desk clerk handed her a bill for $250.00. 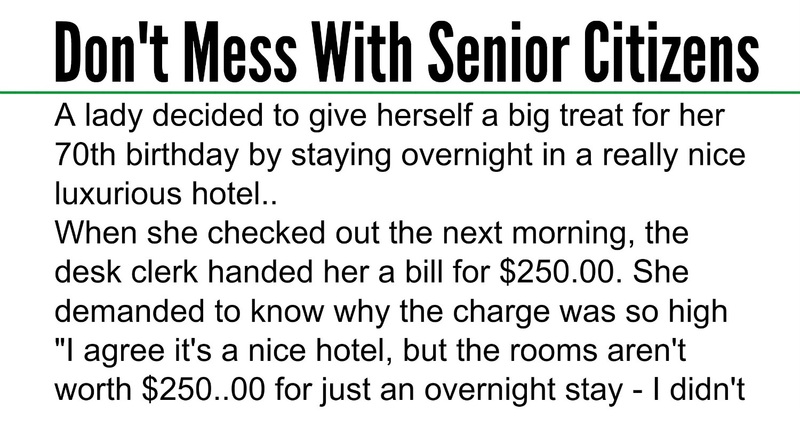 She demanded to know why the charge was so high "I agree it's a nice hotel, but the rooms aren't worth $250..00 for just an overnight stay - I didn't even have breakfast!" The clerk told her that $250.00 is the 'standard rate,' and breakfast had been included had she wanted it. She insisted on speaking to the Manager. The Manager appeared and, forewarned by the desk clerk, announced: "This hotel has an Olympic-sized pool and a huge conference center which are available for use." "But I didn't use them." ''Well, they are here, and you could have." He went on to explain that she could also have seen one of the in-hotel shows for which they were so famous. "We have the best entertainers from all over the world performing here." "But I didn't go to any of those shows.." She Pleaded. "Well, we have them, and you could have." was the reply. After several minutes discussion, and with the Manager still unmoved, she decided to pay, wrote a check and gave it to him. The Manager was surprised when he looked at the check. "But Madam, this check is for only $50.00" "That's correct" she replied "I charged you $200.00 for sleeping with me." "Well, too bad, I was here, and you could have."